We were supposed to go to Basilan. Due to the volatile situation down south (it was really shocking to find out that Ces Drilon and her two cameramans were taken on the day we planned on going there), we decided to look for other places. Several places in Negros was suggested, even Dumaguete. I changed upon a packaged tour that looks mightly appealing (not to mention, cheap) to Puerto Princessa, and that’s how we settled on Palawan. 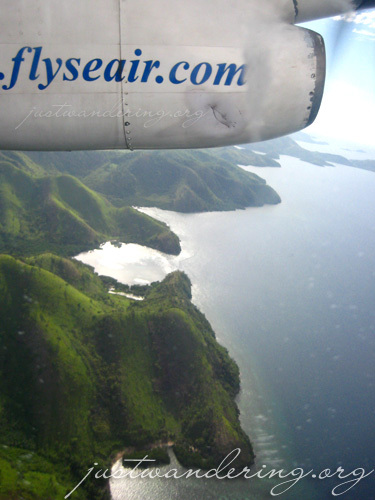 Then Eric had an idea: why not take a Seair flight to Busuanga and visit Coron? Things happened quite fast after that initial idea, and before we know it, we were holding on to a round trip ticket to Busuanga, thanks to Seair. Though as excited as I was about this trip, I have to admit I was a bit hesitant about the plane ride. It’s not that I don’t like Seair, but I have huge problems with ear pressure when flying, and the last time I flew with Seair, it was quite painful. But it seems it’s not the plane that’s the problem; it’s just my ears I’m the only one in the group that felt this pain. Ear pressure aside, it was a pleasant flight. 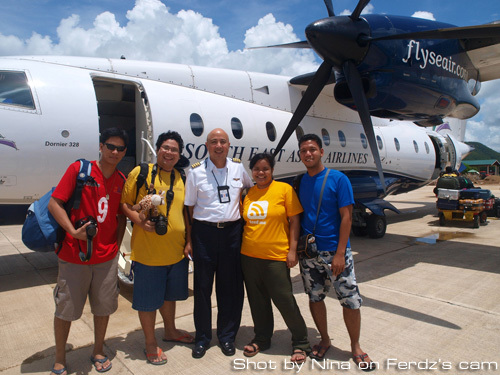 We took the 11:30 am flight to Busuanga, on Seair’s Dornier 328. 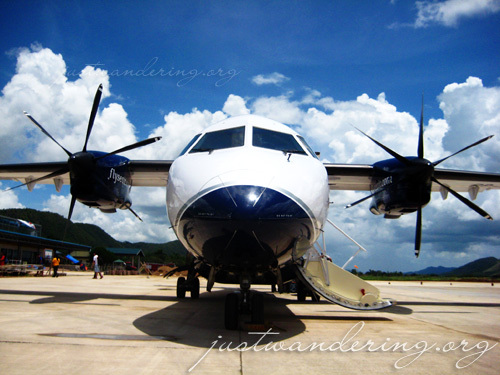 Unlike the Let 410, which we rode before, the Dornier 328 is bigger, and can carry 32 passengers. 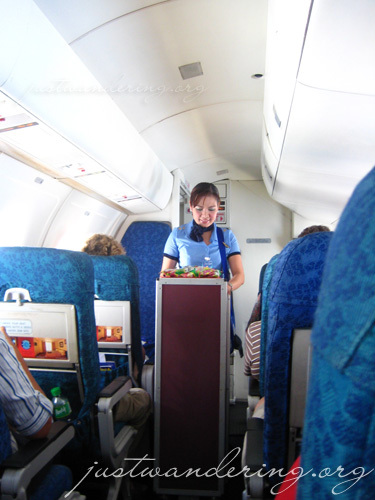 The cabin is pressurized, the seats more comfortable, there’s a toilet on board, and the flight attendant actually stays on board for the flight. Seair boasts of having the fastest flight to Boracay and Palawan. It’s true; our plane touched down just a few minutes past twelve. While airborne, time simply flies by. Those on window seats can look out the window and watch the terrain change as we fly over Luzon and Mindoro. Those on the aisle have Seair’s inflight magazine to pass the time. Snacks are also served on board, and Seair merchandise are available for sale. Traveling alone? You can request for a single seat. The Dornier 328 and Let 410 have a 1-2 seat configuration — no need to share space with strangers if you’re flying solo! The biggest novelty about flying with Seair is still the low altitude their planes fly. I remember when I first rode an airplane. I was so excited to see the city from above, but once we got to cruising altitude, all I could see were the fluffy clouds. And there’s only so much fluffy clouds I can take before I get really bored. It’s different with Seair. Because of the lower altitude, you have the most amazing view of the Philippines from above. Seair’s small aircraft can served airports with shorter runways and even unpaved ones. This means they can serve more destinations that other airlines can’t. Of course, this makes it convenient for those who wants to travel to far flung places, without having to spend several hours on the road or inside a ship. 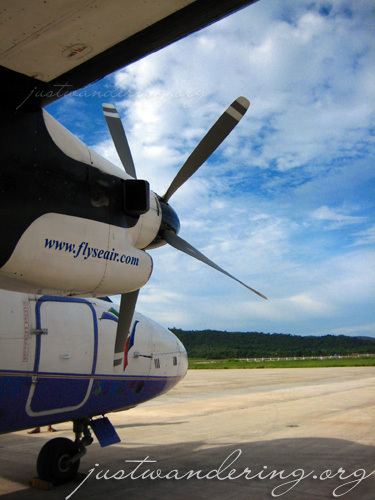 Considering my work schedule, flying with Seair is the perfect choice for flying to my favorite destinations. i love the shot of mountains and the sea. basilan is not safe right now. but it’s a place one should visit.